We offer private rooms, share rooms and dormitories, all with free and unlimited fast wifi. Free tea, coffee and spices. We are a smaller hostel. We do not have a full time onsite reception but have one available across the road. Guests will have access to the swimming pool and spa at our sister hostel 20m away. Our check in time is 12pm to 7.30pm and the check out time is 10am. The office hours are 10am-8pm. Guest that made the booking must provide photo I.D. Children under 18 years old must be accompanied by an adult. Nice and chilled. It’s run by the Dolphin across the road but this is cosier, and you can still use Dolphin facilities. Stayed a few extra nights as felt quite at home. Staff nice and friendly. Facilities lovely a little dirty but nothing you can’t over look. It is a little noisy in the morning and the beds wiggle when the person under or above you move. Also has a lot of tips on what to do in the area. Room was comfortable and clean. Amazing views of the sunset! A bit noisy as we were right next to the communal kitchen/lounge and other guests were watching a movie loudly until late. WiFi kinda patchy, and there's only limited laundry facilities - two washers and one dryer, shared with another hostel across the road. Staff were helpful with suggestions of what to do in the area. Sehr schönes kleines hostel. Mehr ein Familienhaus. Man kann leider erst ab 2 Uhr gegenüber im Hostel einchecken. Man hat keinen Ansprechpartner/Rezeption im Gebäude. Man lebt wie in einer großen WG zusammen. Die Zimmer waren ausreichend groß und hell. Die Badezimmer waren sauber und sehr geräumig. Die Küche klein aber ausreichend. Liegt direkt an einem Highway aber es ist trotzdem angenehm ruhig. Etwas weiter außerhalb. Etwa 15 Minuten zu Fuß bis zum Zentrum. Ich würde definitiv wieder kommen. This place was nice. There was a little confusion, because some other facility in town owns the Sunrise, so we had to go there to check-in, but once we did, things were okay. They have you photograph room lock codes, so hypothetically anyone can just have those for an extended period of time, which is a little sketch. Not sure how often they change the codes. But the room was clean and our roommate was nice. Nice kitchen and bathroom facilities, too. 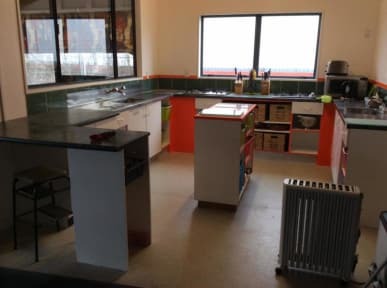 About a 10 minute walk from the centre of Kaikoura, Well equipped kitchen, nice shower and comfortable beds. 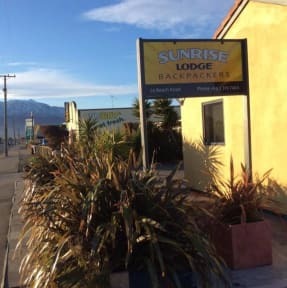 I had to check in at the dusky lodge over the road because noone was at sunrise lodge - apparently they've just taken over the business. There was a bit of confusion with check in times due to the take over but lockers available for my stuff and they sent a staff member over to sunrise and cleaned my bed quickly. Was a decent little place. Not too far away from the grocery store or the local shops. It was a nice place that felt very homey but it was very far out of town. The staff were lovely when we saw them but we did not see much of them. It’s nice and clean though and comfortable and cosy so that’s nice.